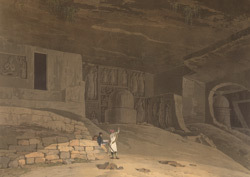 Plate 11 from the fifth set of Thomas and William Daniell's 'Oriental Scenery' called 'Antiquities of India.' There are more than 100 Buddhist caves at Kanheri. This cave, like many more, is one of the simple rock-cut cells that were used by the Buddhist monks in the first and second centuries. The reliefs of standing Buddhas are later additions of the 5th - 6th Centuries. Note the figure of the sketching artist.